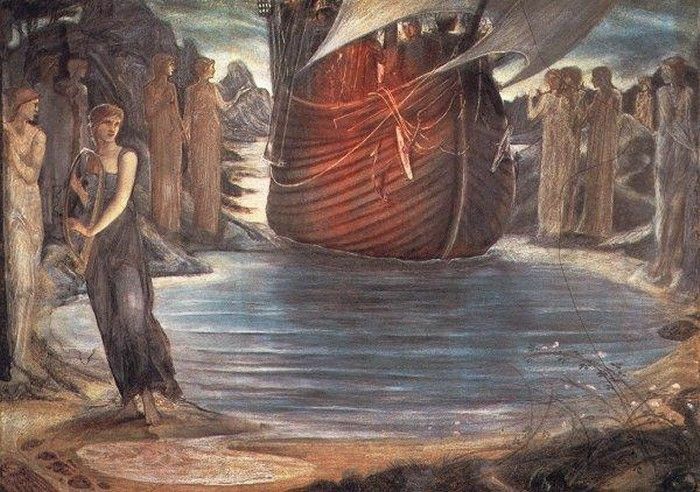 A study for The Sirens by Edward Burne-Jones, 1833-1898. I occasionally get blog comments that start off with something like, “Oh, you’re always putting up recipes for elaborate things enclosed in pastry, or for octopus. What I’d really like are a few easy, midweek dinners I can pull together for my family, quickly and inexpensively.” As someone who finds both joy and therapy in cooking, I do lose sight of what can be done with plain ingredients that people might actually have on hand, like chicken cutlets, for instance. Sorry about that, but often the siren song of bottarga calls and I’m pulled right into the sea. I was thinking about this last night when I came in late from a day of hunting for kitchen space for my spring cooking classes. (Not an easy task in financially complicated Manhattan; if it’s a recession, why are prices still so high? You see empty storefronts all over town, but landlords must be getting tax breaks or something. How else could they go more than a year without budging on their asking price, I ask you. And even to rent a little kitchen space for a few hours, boy what a chore. If anyone has any ideas on this subject, I’d be grateful if you’d let me know.) I don’t know about you, but in addition to the colatura, bottarga, guanciale, lardo, and all the other stinky and glorious Italian pantry items I seem to live on all winter, I eat tons of grape tomatoes. I crave tomatoes all year long, and what else can you get right now in the tomato department that’s decent? And they are decent, maybe not always for eating raw, but great for roasting or quick sautéing for, say, a pasta sauce, and if they turn out to be a little sour, you can always adjust with a pinch of sugar. On my way home I had bought a couple of those pre-flattened chicken cutlets at the supermarket. They’re not my favorite thing, a little flavorless, but they’re okay for a quick dinner, and they do cook quickly, very quickly, so you need to get your oil hot, and you want to lightly brown each side with your best flash-cook technique, so you won’t wind up with a piece of shoe leather. 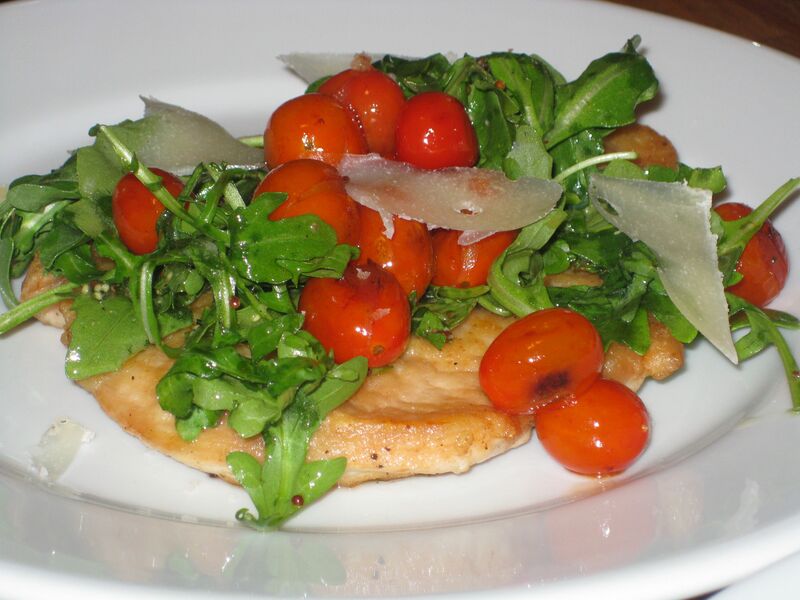 I seared the grape tomatoes in olive oil to make a little warm salad to plop on top of the chicken. Pretty healthy and easy, I figured. I did happen to have a lovely chunk of Raschera cheese on hand (no quick-and-easy goes unembellished by this dame). Raschera is a cow’s milk cheese from the province of Cuneo in Piemonte. You can buy it young, when its texture is soft and its flavor gentle, or choose a stronger aged version, good for shaving or grating, as I did. The aged Raschera has a complex and subtle saltiness with a sweet undertone. It tastes a little like Asiago, only a lot more sophisticated. You can buy it at Di Palo’s cheese shop on Grand Street in Manhattan, or order it through their website at www.dipaloselects.com. You can substitute Asiago if you like. I think this easy but slightly pungent piatto unico would go very nicely with a glass or two of Dolcetto wine. In terms of cooking time, the entire recipe goes down in about ten minutes. In a medium skillet, heat a tablespoon of olive oil over medium-high heat. When hot, add the tomatoes, and sear them quickly, just until they’re lightly browned and starting to burst. Add the garlic, salt, and black pepper, and sear a few seconds longer, just to release the garlic’s flavor. Add a splash of water to the skillet, and turn off the heat. In a small bowl mix together about half the lemon juice, the mustard, salt, black pepper, and 2 tablespoons of olive oil. Place the flour on a plate, and mix it with the allspice and hot paprika and a generous amount of salt and black pepper. In a large skillet, heat 3 tablespoons of olive oil over medium-high flame. Dredge the chicken in the flour. When the oil is hot, add the chicken, cooking it quickly, just until golden. Give the cutlets a flip, and cook the other side just until golden. The entire cooking should take only a little more than a minute. Place the cutlets on two dinner plates. Add the tomatoes and the thyme to the arugula. Pour on the dressing and toss. Squeeze the remaining lemon juice over the cutlets, and then pile some salad on top of each one. Shave a few thin slices of Raschera over the top, and serve right away.